Interoperability is at an intriguing intersection right now. In one corner are the people suggesting that despite some $35 billion and 10 years of work since the HITECH Act under the American Recovery and Reinvestment Act kicked off the widespread digitization of healthcare very little actual progress has been achieved in terms of making data and electronic health records interoperable in actionable formats. In the other corner are those who counter that reaching near-ubiquity of EHRs among hospitals, health systems and medical practices means the basic infrastructure needed for interoperability exists, at this point, the foundation has been set. The normative FHIR 4, Open APIs, the Carequality and CommonWell milestone of all members being able to share continuity of care documents with each other, EHR vendors' fledgling but promising thrid-party developer programs, as well as proposed rules from the Centers for Medicare and Medicaid Services and the Office of the National Coordinator for Health IT that aim to eradicate information blocking and enable a new era of data sharing and health information exchange. 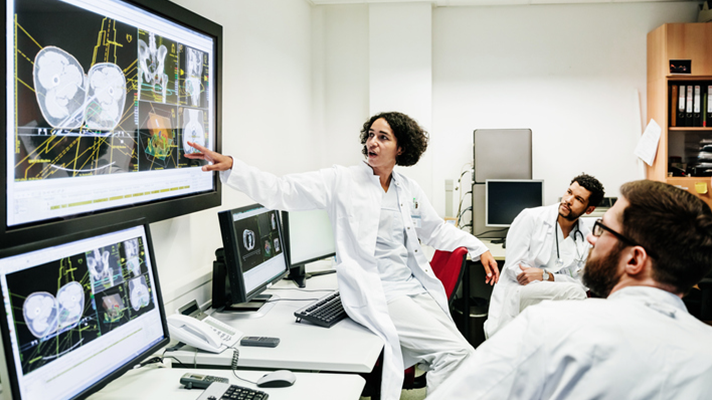 That debate both highlights the enormity of the problem and makes this the ideal time for Healthcare IT News to Focus on interoperability during April. We conducted original research among 147 qualified respondents to determine exactly where hospitals, health systems and acute care facilities really stand with interoperability. As you can see from the above chart, nearly 75 percent of respondents indicated that they are beyond a foundational level of interoperability – that being the ability to exchange data between system of record but not necessarily being able to interpret the information. And survey participants are pretty much neck-and-neck when it comes to practicing interoperability at the structural and semantic levels. 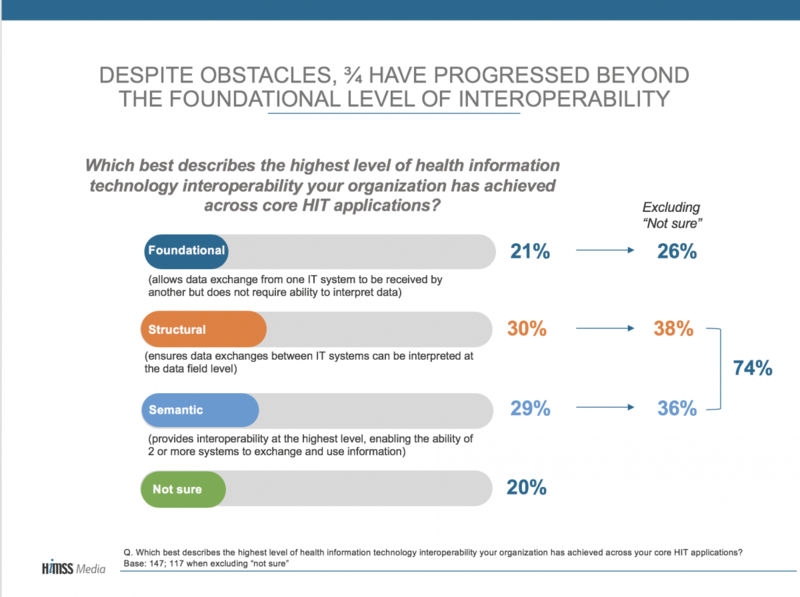 It’s worth pausing to note here that in March, Healthcare IT News owner HIMSS proposed a new definition of interoperability and, in so doing, added a fourth layer: organizational interoperability. Whereas the structural layer involves some interpretation of exchanged data and semantic means the data is able to actually be used, organizational interoperability goes beyond data sharing to include policy, social and organizational aspects to enable secure and timely use of data among individuals and organizations alike. Now, among those study respondents, a number of best practices for advancing interoperability arose. 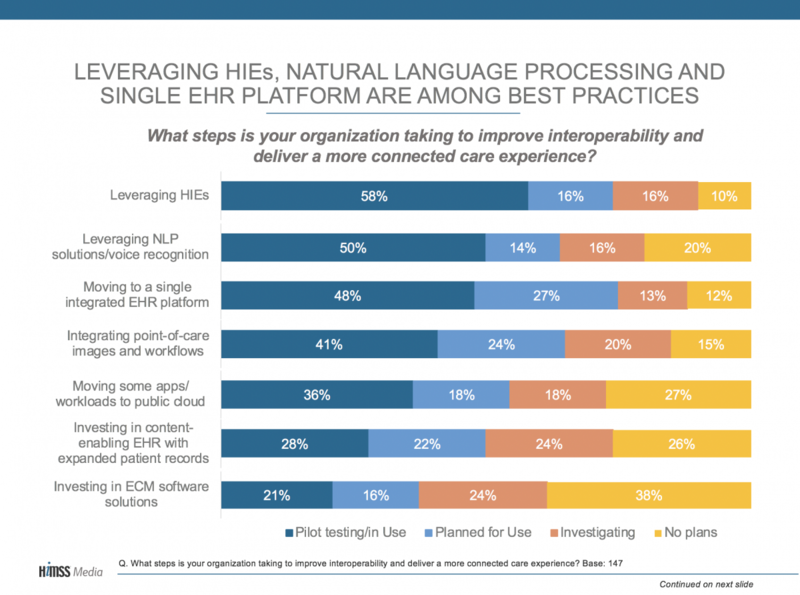 Chief among those best practices for interoperability is signing on with an HIE to essentially let it handle the technical components of exchanging health information, followed by using natural language processing and voice recognition technologies and migrating to a single enterprise EHR. Going the EHR route, however, will primarily help with internal-system data sharing and, in certain instances, exchanging data with other health entities that use a similar version of the same vendor’s EHR. It’s also noteworthy that putting apps into a public cloud and deploying enterprise content management platforms ranked among the best practices. And what about application programming interfaces? APIs are all the rage in healthcare and everywhere these days and our research found that half are either already tapping into APIs or have plans to do relatively soon. 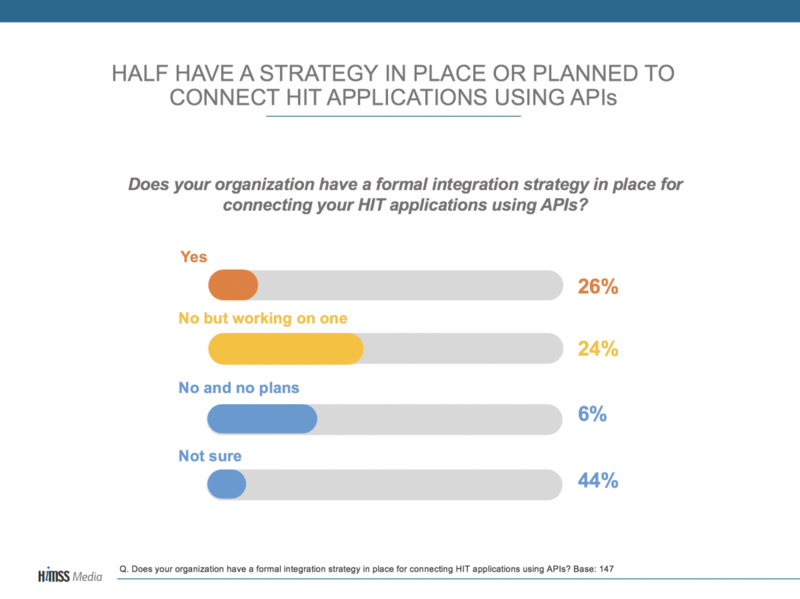 It’s also noteworthy, of course, that the other half of our research participants either have no plans to use APIs (6 percent) or are unsure of how, when and if they will do so (44 percent). We also found that nearly half are planning to use HL7 FHIR and a similar percentage have intentions for DICOM, while fewer are opting for IHE International’s XDS specification. Throughout April we will be publishing articles, data and videos about interoperability to advance the discourse beyond the fact that it’s a hard problem that appears to be taking forever to solve. We’ll unpack the proposed info-blocking rule that HHS dropped back at HIMSS19 with national coordinator Dr. Donald Rucker, present case studies of real-world interoperability in action, take a reality check of just how interoperable EHR vendors really are or are not, delve into FHIR and APIs and circle back on the new definition that HIMSS proposed for a status check as they read the public comments, and more.